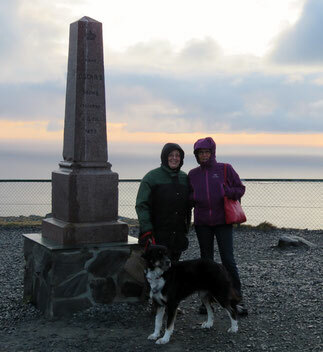 It was a very good idea from my wife Astrid to take me up to the North Cape with the campervan. 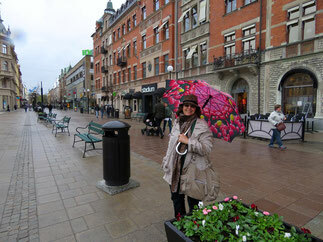 After the hustle and bustle of the last days, this was a relaxing travel through Germany, Denmark and the southern part of Sweden. Our first night we spent at a Car park for heavy trucks north of Giessen. Thanks to the super backup work of my webmaster (many thanks Annina), we got the address of my former supervisor who taught ethology for years at the University of Kassel. Therefore we could visit him and his wife in a nearby village. The next night we spent in Walsrode and then drove over Lübeck to Grömitz on the Baltic Sea for our third night. From here it was a stone`s throw to Puttgarden, the port of the ferry to Denmark. 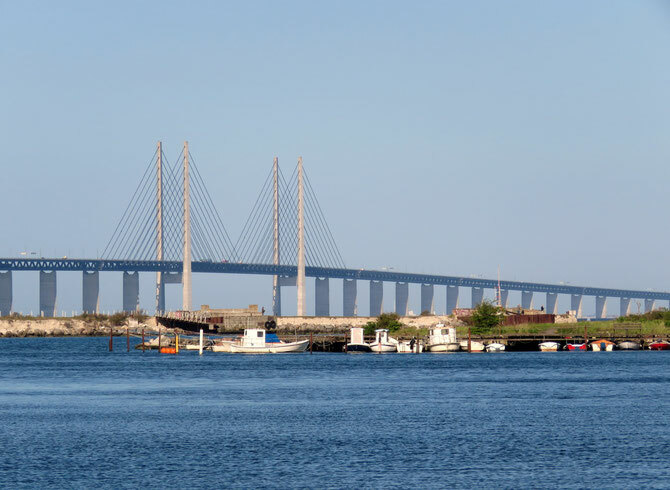 In very few hours we drove through Denmark and then crossed the Oeresund over the new bridge to Malmö in Sweden. The crossing in stormy weather demanded something from our old campervan. He was almost thrown off his track by a heavy wind gust. The next day, the bridge, viewed from our campsite, presented itself in the most beautiful sunshine. 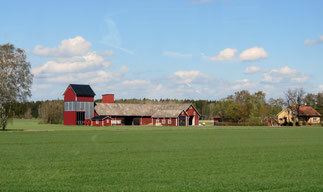 We drove swift through the agricultural south of Sweden to Oerebro. 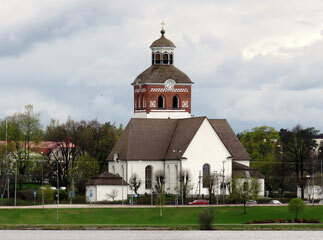 Bollnäss and Hasnösand were the next towns.Everwhere we found nice churches - an expression of a religious country? 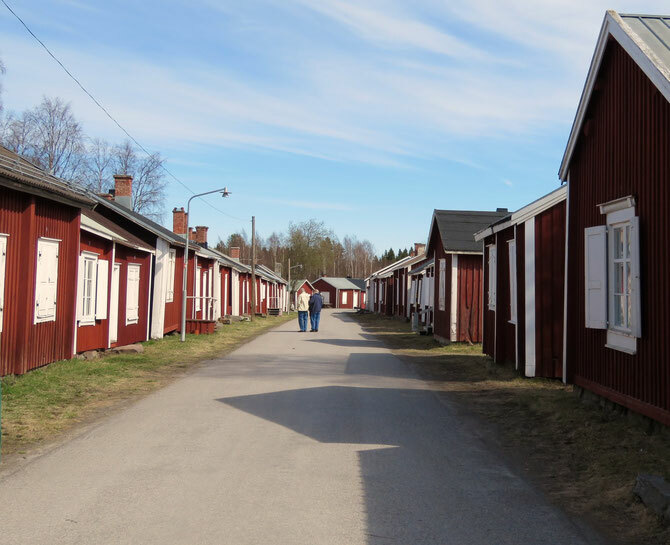 A short detour to Sundvall before arriving on a camp site with a Swiss manager from Wädenswil/ZH. 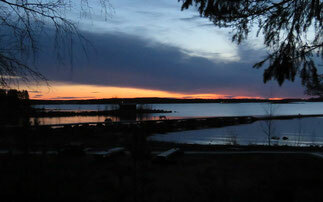 From Härnösand we drove along Sweden`s scenic east cost to Rundvik. 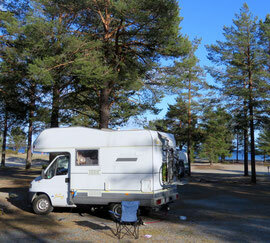 This campsite had a incredible sandy beach - just like Pacific beaches in Costa Rica with Pines instead of palmtrees. 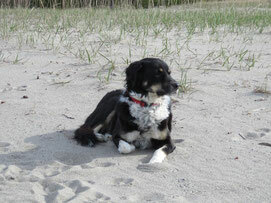 Former beach dog Dimitri felt here indescribably well. 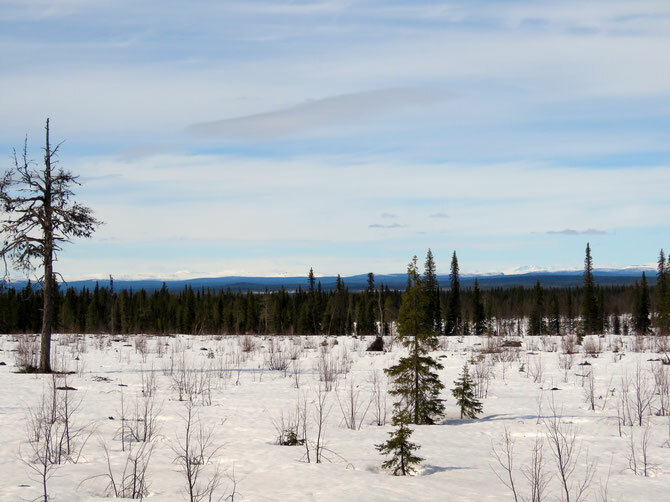 Next morning we moved on in the direction to Lulea. But before we reached this town we had to stay on an other lovely beach where we could experience a little taste of midnight sun. 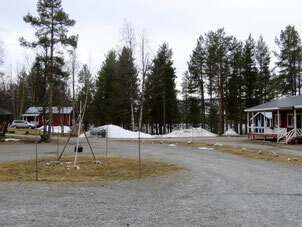 Astrid suggested a visit of the old "Gammelstad Kirkstad" of Lulea. 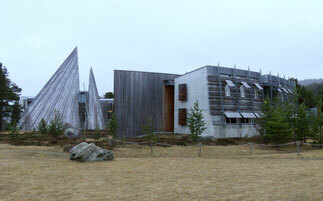 This is a kind of a museum with many old houses. 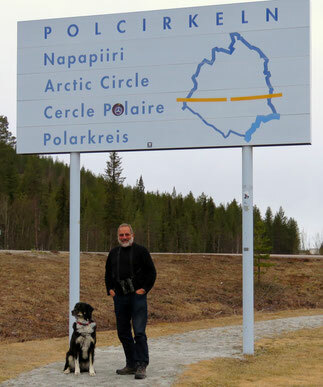 and soon we reached the ARCTIC CIRCLE. 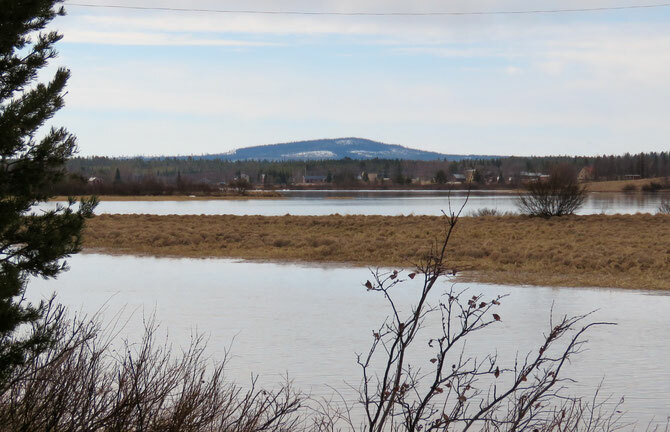 still intact snow cover. 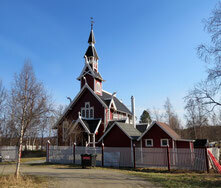 We reached Vittangi in most beautiful sunshine and ahead we had to cross a part of Finnland before reaching Norway. In Vittangi we met our first long distance cyclist, James Harvey. 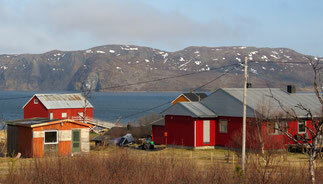 He left North Cape six days ago. I was very impressed and as a greenhorn asked him numerous silly things. Now we had to cross our next two borders. 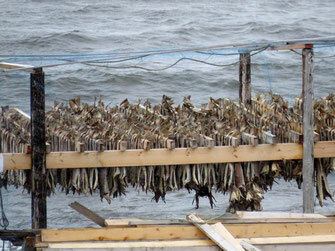 At Karesuando from Sweden to Finnland and in Kivilompolo from Finnland to Norway. In Norway I went again to the border post with the passport of Dimitri. The officer just scrolled without proper knowledge in the passport. No control of the dogs identification, no idea where the important entries in the passport are - that`s definitely a no go. 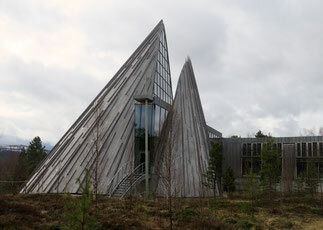 Now we went on to the Samitown of Kautokeino in Norway where we staid overnight. In the morning, what a surprise snowstorm and 3 cm of snow on our stairs. 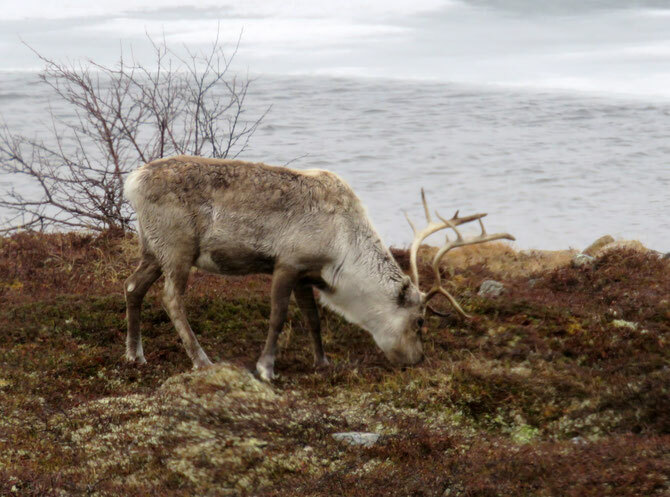 Despite snow and rain we proceeded to Karasjok and to our next campsite in Skoganvarri where we also met "Rudolf" the reindeer. means bridge over the Tana river. 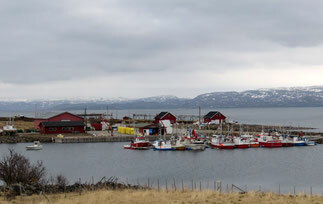 In Tabru we were close to my destination for bird watching, the Varangerfjord. I had a Webpage for ornithologists but they just closed the firm. Maybe I will go to another server - but then I will inform you. 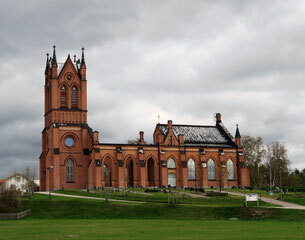 The church of Nesseby is a real gem. 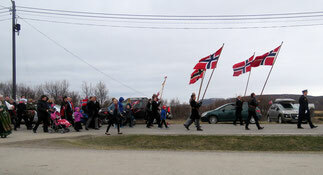 During our stay at Vadso was the National Day of Norway with colorful parades in every little community. Happy people in traditional costumes everywhere. 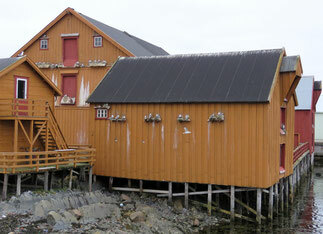 On Vardoe Island I immediately noticed the many Kittiwakes.They nest here on virtually every building near the harbor. 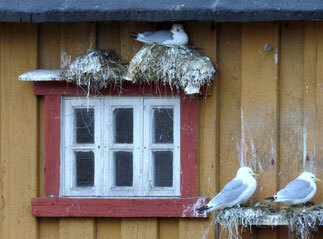 These birds are tolerated by the people and the owner of the houses even offer little boards which the gulls use as nesting pads. 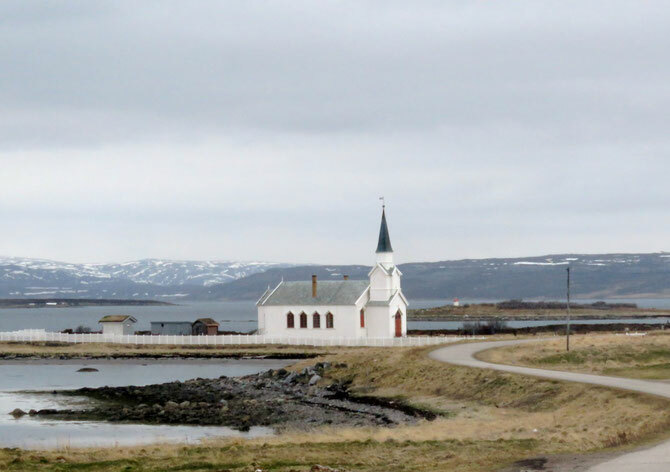 Also south of the Varangerfjord we can find beautiful fishing villages and specially zhe church of Neiden is a real gem. 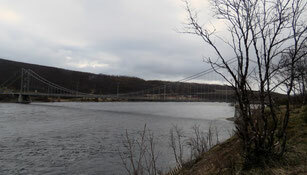 We are now in Kirkenes, the end of the Hurtigruten and only a few kilometers from the Russian border. 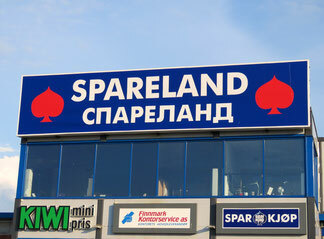 Shopping Center and most other things are already written in the russian language with kyrilic letters. 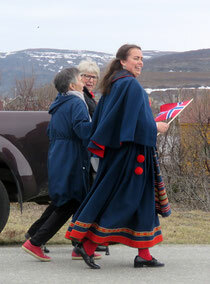 The following day we had a short drive to Kirkenes Airport to pick our friend Barbara. 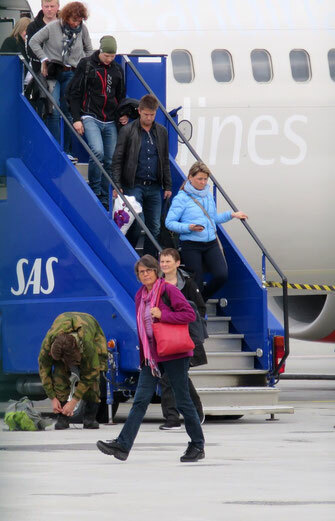 Barbara fährt nach dem Besuch am Nordkap dann mit Astrid duch Finnland nach Stockholm wo sie dann von Annina und unserer Enkelin Emma erwartet werden. Zuerst aber ging’s zurück nach Karasjok, wo in einem architektonisch höchst interessanten Gebäude gerade das Samiparlament tagte. 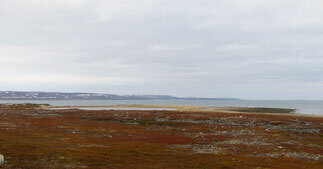 Karasjok - Hooingsvag and direct to the North Cape was the next step. The following day was supposed to start THE BIG ADVENTURE.